All Power to the People! features Black Panther Party posters and newspaper graphics produced in the 1960s and 1970s. The exhibition highlights the artistry of Emory Douglas, and documents the Panthers’ involvement with a broad array of causes, including opposition to the Vietnam War and solidarity with the United Farm Workers movement. With documents obtained through the Freedom of Information Act (FOIA), All Power to the People! also illustrates efforts of the United States government to destroy the Panthers as part of wide-spread efforts to stifle oppositional political movements. The social programs of the Panthers and the powerful images of armed party members had a strong impact on the public consciousness of the time, and their efforts to combat the oppression of racism and poverty still resonate today. Curated by Heather Haynes and Izida Zorde. 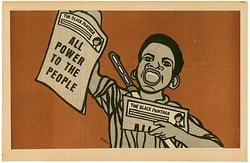 Emory Douglas was born in Grand Rapids, Michigan, and has been a resident of the Bay Area since 1951. He became the Minister of Culture for the Black Panther Party in 1967, a role he held until the party disbanded in the early 1980s. During the Party’s active years he served as the art director overseeing the design and layout of the Black Panther, the Party’s weekly newspaper. Douglas was trained as a commercial artist at City College of San Francisco and has been the subject of several solo exhibitions. His work has also been in numerous exhibitions about the history of the Black Panther Party, including shows at the Arts & Culture Conference of the Black Panther Party in Atlanta, GA in 2008 and “The Black Panther Rank and File” at the Yerba Buena Center for the Arts, San Francisco in 2006. Most recently his work was the subject of a solo exhibition at Urbis, Manchester, UK in 2008-2009. In 2007, artist Sam Durant curated a solo exhibition of Douglas’ work at the MOCA Pacific Design Center in Los Angeles, “Black Panther: The Revolutionary Art of Emory Douglas,” which is the inspiration for the presentation at the New Museum. The same year, Rizzoli published a book with the same title that included essays and interviews about Douglas’s work and his relationship to the Black Panther Party. Douglas’s work has also been presented at the 2008 Biennale of Sydney, Australia; the African American Art & Cultural Complex, San Francisco; Richmond Art Center, CA; and the Station Museum of Contemporary Art, Houston.